6. All development should have regard to the setting of the historic core of the town recognising the importance of Ludlow Castle as an historic asset of national and international significance. Development of the allocated housing sites identified on the Policies Map should be in accordance with Policies CS6, CS9 and CS11, Policies MD2, MD3 and MD8, and the developer guidelines and approximate site provision figures set out in this schedule. Development of the allocated employment sites identified on the Policies Map should be in accordance with Policies CS6, CS9, and CS14, Policies MD2, MD4 and MD8, and the development guidelines and approximate site provision areas set out in this schedule. 5.104 Ludlow plays a role as a significant employment centre for the wider area. In addition to safeguarding existing employment sites, a continued supply of employment land is required to support and enhance this role. The Eco Park has developed into a recognised business area following significant public investment and its location off the A49 provides strategic locational benefits. Allocation for further expansion of employment uses at the Ludlow Eco Park will help to provide balanced development over the Plan Period. The allocated employment sites in Schedule S10.1b above will complement the committed urban employment sites set out in Schedule S10.1c below to provide a range and choice of economic development opportunities in the town. 5.107 The town will build on its role as a Principal Centre (in line with Policy CS15). Proposals for retail and other main town centre uses in Ludlow will need to satisfy the policy requirements in Policies CS15 and MD10. Following the final consultation on SAMDev, a number of amendments are to be made across the county. This includes a change for Ludlow. 3 Primary Shopping Areas: Indigo Planning, on behalf of Mrs D Prosser, propose a change to the extent of the proposed Primary Shopping Area (PSA) for Ludlow. This would remove Upper Galdeford and Tower Street from the PSA, whilst retaining the rest of the proposed PSA area. They consider Tower Street to have a greater mix of uses and that its identification would be overly restrictive towards retail. Response: Proposed Change. 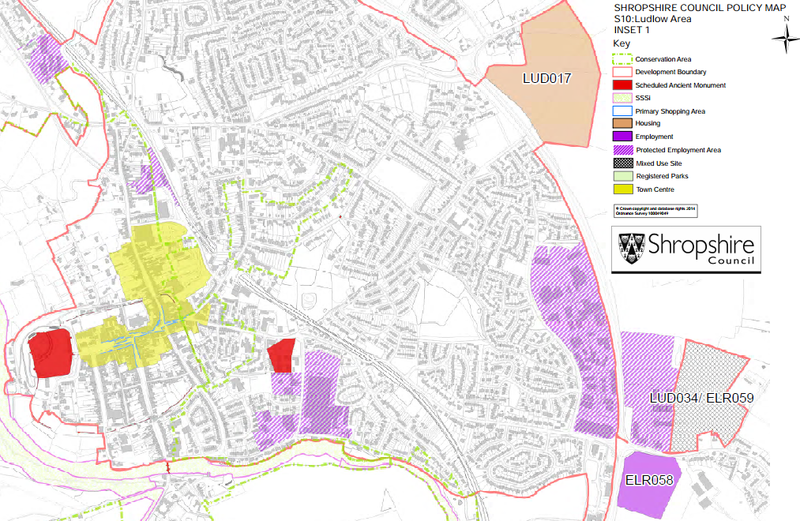 Amend the Policies Inset Map for Ludlow to remove Tower Street from the PSA, but retain the existing premises of One Stop and Sommerfield [sic] within the PSA. It is agreed that this would more appropriately reflect the mix of uses along Tower Street whilst maintaining suitable policy management over two centrally located retail units.